The key to having happy, healthy fish is good quality water. Never add fish to plain tap water. Tap water contains chemicals that will harm fish. So before adding fish, add API Stress Coat.� Stress Coat neutralises the harmful chemicals in tap water.� Stress Coat also contains Aloe Vera to protect, soothe and heal fish, and is scientfically proven to reduce fish stress. Healthy aquariums develop a natural cycle called biological filtration.� This cycle converts poisionous compounds from fish waste and uneaten food into harmless substances. A new aquarium need help to get this cycle started.� API Quick Start adds live, nitrifying bacteria to immediately start the aquarium cycle. 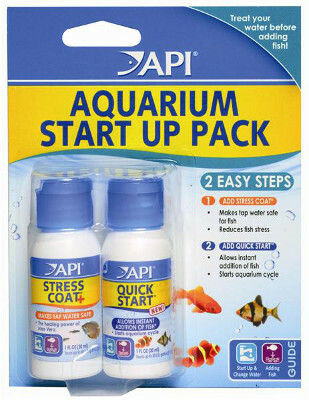 DOSAGE: API Stress Coat - 10mL (2 teaspoons) per 38 Litres of aquarium water.� API Quick Start - 10 mL (2 teaspoons) per 38 Litres of aquarium water.� More detailed directions are on the product card.